Local corn in the market is the sure signal that the summer harvest is nigh. It’s a fine time to sit on the porch and husk away while the children play kick the can. (Alternatively you could come to Salty’s, sit on the deck with a luscious lemonade, kick back and let us do the work cuz you deserve it!) We all have great memories of corn on the cob, right? My brothers chomping away, pretending to be a typewriter singing out “ding” at the end, comes to mind. 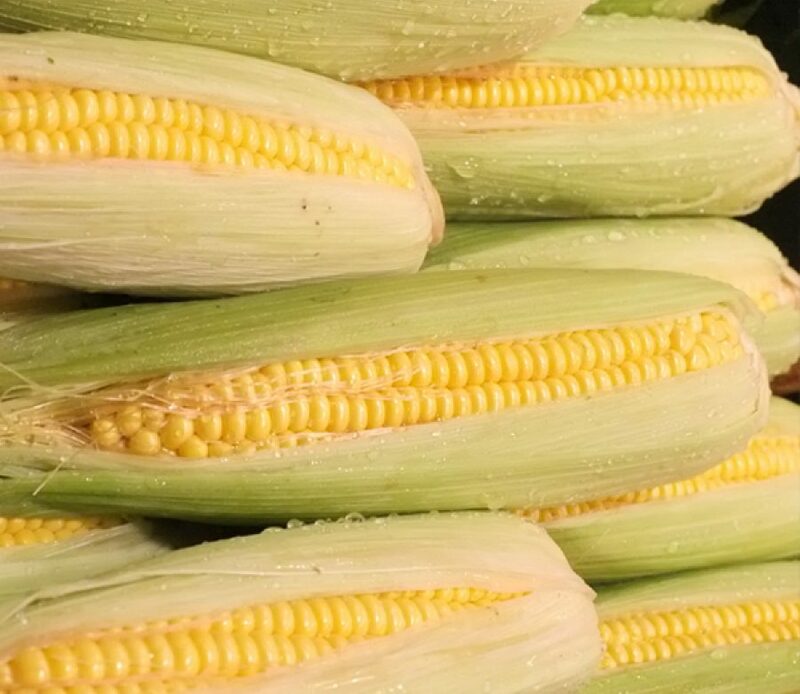 As to the venerable ear of corn, nothing says summer like the bursting crunchy texture of the good stuff. If you are flailing out there on your own, how do you hunt and peck for the best? FIRST, BUY LOCAL. Hopefully you have a local farmers market. If not, buy the corn that says “local” at your store. Your produce person can easily direct you. Buying local corn does something extra for the flavor because it is harvested at its ripest and most nutritious moment. There is a good-bye kiss from the sun that converts corn starch to sugar and it only happens in the last stage of the ripening process. If it is plucked early for shipping, unfortunately that conversion to “sweet corn” never happens. Corn is actually categorized as a grain not a vegetable, so give it the proper place on your plate to get a well balanced meal. SECOND, GO GREEN. I mean that two ways. Hopefully you can find corn that was grown from non-GMO seeds and is organic; that would be the blue-ribbon best. Also look for the greenest husks. That will indicate that it is super fresh. Those green leaves on the outside should be moist and supple, not dried out, crispy or yellowing at the tips. THIRD, FEEL IT. I have a friend who says we should choose our vegetables by feeling their energy. I know that may sound strange, but pick it up and see if it feels heavy, firm and friendly :). Lightly squeeze it from head to toe, checking for soft spots. FOURTH, PEEK AT IT. Don’t be shy, carefully peel back that husk a bit and take a peek. The “angel hair” strands inside should be moist and sticky. Check the kernels for even rows. (This is essential for the typewriter-chomp, chomp, chomp DING!). Look for dehydrated areas, brown spots or missing kernels. No one wants that piece of corn. FIFTH, PEEL IT. Only do this at the last moment because corn dehydrates without its jacket on. Better yet, you can soak it in water for an hour or so, then cover it in foil and bake it in the oven. When it is still tender crisp, pull back the leaves and use them for a handle. That way no one is stuck with peeling the ears except the eater. Now relax and enjoy those dog days of summer.